Tiananmen Square is the largest city square in the world, at 440,000 square meters, and can hold about one million people for public celebration or gatherings. In the square tourists can climb the Tiananmen Rostrum, attend the national flag raising ceremony every morning at sunrise, visit the National Museum of China, and go to the Mausoleum of Mao Zedong, in which one will see the body of the great Chinese leader.Located at the center of Beijing City is Tiananmen Square, where you can visit Tiananmen Tower, Monument to the People's Heroes, Great Hall of the People, Mao Zedong Memorial Hall and see the national flag raising ceremony. Thousands of people come to the Square every day. 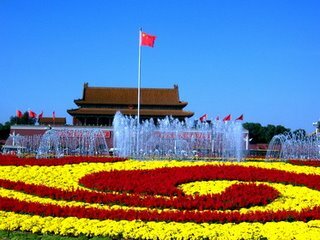 It is the must place to visit in Beijing City.At the north end of the Square is Tiananmen Tower. 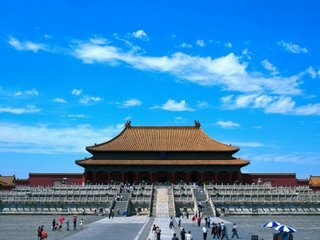 Initially built in 1417 during the Ming Dynasty (1368 A.D.- 1644 A.D.), the Square was the front door of the Forbidden City. The most important use of it in the past was to declare in a big ceremony to the common people who became the emperor and who became the empress. Until 1911 when the last feudal kingdom was over, no one could enter the Tower except for the royal family and aristocrats. The granite Monument to the People's Heroes is just at the center of the Tiananmen Square. Built in 1952, it is the largest monument in China's history. ' The People's Heroes are Immortal' written by Chairman Mao is engraved on the monument. Eight unusually large relief sculptures show to the people the development of Chinese modern history. Two rows of white marble railings enclose the monument, simple and beautiful. Mao Zedong Memorial Hall is at the south side of the Square. This Hall is divided into three halls and our dear Chairman Mao's body lies in a crystal coffin in one of the halls surrounded by fresh bouquets of various famous flowers and grasses. Another important place for the tourist to visit is the China National Museum at the east side of the Square. It just came into existence in 2003 and is a combination of Chinese History Museum and Chinese Revolutionary Museum. This National Museum faces the Great Hall of the People. Inside the Chinese Revolutionary Museum are a lot of material objects, pictures, books and models to present the development of modern China. The Chinese History Museum shows a large number of cultural relics illustrating the long history and glorious culture of China from 1,700,000 years ago to 1921 when the last emperor left the throne.Now Tiananmen Square is one of the most famous and popular places in China. It is the place for celebrations on such festive days as International Labor Day on May 1 and National Day on October 1. Tian'anmen Square had completed its renovation to welcome the 50th anniversary of China in 1999.